Smartphone scanners (or Sled scanners) are barcode scanning tools that attach to your smartphone. Most smartphones already have scanning capability through the camera. However, smartphones are not meant for this purpose so the process is slow, inefficient, and difficult. Sled scanners, which attach to your smartphone like a case, remedy this tech issue. 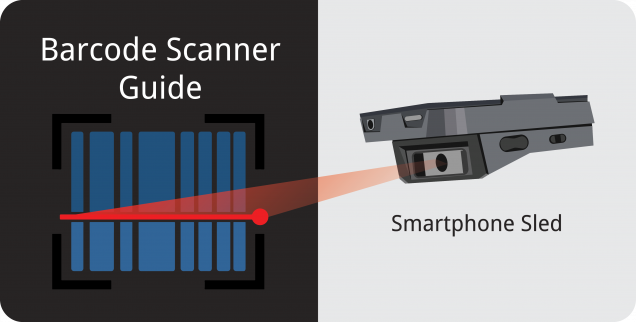 These scanners are a great option for optimizing a phone’s scanning capability. Although these scanners are not as powerful as mobile computers, they come at a much more affordable price point. If you are looking for a low-cost real-time solution, smartphone sled range in price from $200 to $800. Like the mobile computers, sled scanners have access to mobile networks, data and WiFi connections. They are able to push and pull information to your cloud-based inventory system at anytime from anywhere. Sled scanners are extremely portable and lightweight barcode scanners. Not much larger than the smartphone, you can easily carry these through a retail or warehouse environment for long hours. They are also ideal for field service businesses since they can easily go on the road with service workers. Smartphone scanners such as the Koamtac KDC400 use cross-platform functionality. This allows users to use the same scanner on different smartphone models. By allowing different models, the smartphone scanner can cater to a larger audience without losing customers based on smartphone preference. These scanners are great for sporadic use a handful of times throughout a work day. But, if your employees are scanning hundreds of items a day this scanner is not the best option. This is because standalone scanners are much faster. Another disadvantage for this scanner is the inability to operate in extreme weather conditions. Also, they are not durable enough for rough work environments. An ideal environment for this type of scanner would be in a retail or controlled warehouse location. Different types of barcode scanners will be discussed over the next few weeks, including mobile computers and offline data collection devices. Links will be provided to connect the posts and technologies detailed in this series.